Earlier on Face of IT, we have discussed M.2 SSDs many times before. 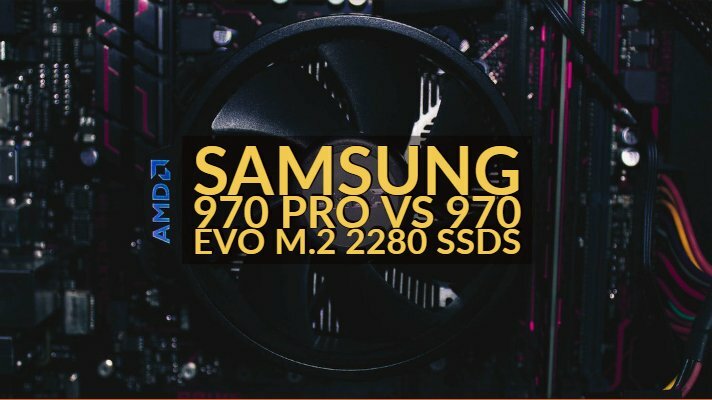 Today, we will be comparing two of the best M.2 2280 SSDs produced by Samsung, the Samsung 970 Pro vs 970 Evo. We will go through all the little details in order to determine which one stands on the top. But before we get going, here is a little understanding about M.2 SSDs. While both of them are very similar, they sell at different price points. The devil is in the details. We will be comparing them side by side to understand better how they differ from each other. We are starting with the necessary details first. Both Samsung 970 Pro and Samsung 970 Evo are Consumer level internal solid state drives (SSDs) manufactured and sold by Samsung. However, they belong to different lineups. Generally meant for mobile computing devices such as notebooks, ultrabooks, laptops, etc., they are now also used for small form factor desktops. As the table above clearly implies, there is hardly any difference in the platform. They come in the same M.2 2280 form factor. As we mentioned in our previous articles all M.2 2232, M.2 2260 and M.2 2280 are M.2 SSDs only. The leading number describes their length and width. (i.e M.2 2242 is 22 x 42 mm). So in our case, both of these are 22mm x 80mm SSDs. Going further, both of them utilize the same memory components, interface, controller technology and have the same size and type of cache as well. The only difference we see here is the available capacity variations. The Samsung 970 Pro is available in two variants of 512 GB and 1 TB only. On the other hand, Samsung Evo 970 comes with a lot of options from small to large scale, which is, in fact, a plus point. Suppose you want an SSD for installing OS, so 250 GB will be just perfect for you, rather than investing in 512 GB. Here, we can see that the performance level of Samsung 970 Pro and Samsung 970 Evo is almost identical in reading and mean time between failures. However, the Evo lacks a bit when it comes to writing performance. As the table shows, the sequential read, 4KB random read, and MTBF is similar for both the M.2 SSDs, however, Samsung 970 Pro does slightly better when it comes to Max sequential write and 4KB random write. In idle mode, power consumption is the same for both Samsung 970 Pro and Samsung 970 Evo, which is 30 mW. Inactive state Samsung 970 Evo consumes 5.7 W on average loads and up to 10 W on peak moments. On the other hand, Samsung 970 Pro consumes only 5.2 W on average loads and 8.5 W on peak moments, which is, in fact, better than the Evo. Both drives may heat up to 70° C. Moreover, the max shock resistance capacity is similar for both M.2 SSDs as well. As we described earlier, both of these drives have exactly the same form factor, so the dimensions and weight figures are the same as well. We hope this comparison helps you to understand these M.2 2280 SSDs by Samsung and help you to choose the right one according to your needs and requirements. If you want something small scale, Evo is best for you. However, if you are looking for performance and ready to invest some extra cash, then you can go for Samsung 970 Pro. If there are any queries or suggestions from your side, feel free to drop a comment below, we are happy to help. Make sure to subscribe face of IT for regular tech updates. See ya until next post, Thank You!